2013 SIX FLAGS OVER TEXAS DISCOUNT LIST! Theme parks can get a bit pricey but here are a few ways you can save when you visit the park. Please note these discounts are for the Six Flags Over Texas location. I will update as more discount information comes my way! Regular Price Tickets at the gate. Purchasing your tickets online at sixflags.com will always save you money. Pay the kids price of $44.99 when you purchase online. Save $18 when you purchase advance tickets online at least three days before your visit and pay $41.99. If you choose not to purchase online, simply bring any Coca-Cola can to the gate to receive a special discounted price of $44.99. The can does not have to be specially marked and diet varieties are accepted. EXPERIENCE ARLINGTON DISCOUNT – $45.09 + $2.00 convenience fee per ticket. Visit Experience Arlington to order your tickets for the discounted price of $45.09. You will have to pay a convenience fee of $2.00 per ticket purchased. * If you are a member of AAA, visit your local office to pick up admission tickets and pay just $38.99 per ticket. * Save $5 on general front-gate admission at the park. 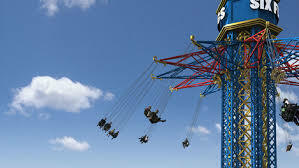 * Save up to 30% on tickets and waiver of Print-N-Go Fee ($5 value) when you purchase tickets at AAA.com/sixflags. Students and Faculty of Dallas County Community College can visit DCCD.edu to purchase tickets for $39.99. Please note there is a tax of $3.20 added to each ticket. A $5.99 order processing fee will also be charged (this fee is charged only 1 time no matter how many tickets you purchase on your order). Next postNational Mom’s Night Out May 9th @ North East Mall ~ FREE Goodies!